Cooking is an art and learning that art is a never ending sea. There are lots of dishes around the world, which are familiar but haven’t tried in our kitchen or unaware of that dish. In order to explore such types of cuisines, sitting in our home is the main motto of this Monthly event. This event is going to happen every month with an alphabetical order of countries. All you have to do is, just try to explore that particular country recipes and do a blog post with a detailed description along with their culture info on cuisine and link it back to our given space. Myself and Lakshmi vimala from “cookingclub17.blogspot.com“ have joined hands to host this Interesting event. Please do visit her page also for event related information. 1. Every month a country will be announced on the basis of Alphabets and the specific menus of dishes. You have to prepare that dish that can be cooking or baking under the theme. 3. Non-bloggers who wish to participate have to post their dish with pictures on the group itself with the hashtag. 4. Usage of logo and hashtag is mandatory. 5. We’ll create a html from all of our posts and share the link on the group. Bloggers has to update the html along with your post. 6. All should enter through that link and comment on others posts. This is mandatory. 7. 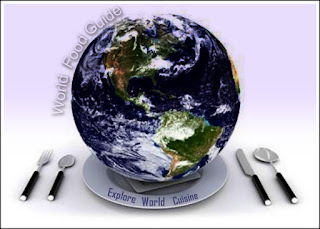 Winners of WFG event, bloggers as well as non-bloggers will be chosen according to their recipe selection, their active participation and commenting on other bloggers post will be given a badge as “AMAZING CHEF OF WORLDFOODGUIDE”. 8. Non – bloggers winners are also selected on the basis of their recipe selection, active participation and commenting in the group post on world food guide face book page. 7. The post entries after 15th will not be included in that month’s event. Happy Cooking ! All the best friends !